Author contributions: Currie G, McKay G and Delles C equally contributed to this paper. Core tip: Microalbuminuria (MA) is the earliest and most commonly used clinical index of diabetic nephropathy (DN), however its sensitivity and specificity for early disease detection are limited. Not all patients with MA progress to overt DN, nonalbuminuric DN is common and risk associated with MA is elevated even at levels below currently accepted diagnostic thresholds. There is therefore a need for alternative biomarkers allowing early identification of “at risk” individuals. This review focusses on biomarkers of glomerular and tubular dysfunction, oxidative stress and inflammation that have attracted interest. In addition we review more novel strategies including proteomic, metabolomic and genomic approaches. The global incidence of type 2 diabetes continues to rise due to the increase in obesity and the aging population. In 2000 the prevalence of diabetes was estimated to be 171 million (2.8%) worldwide. It is projected that by 2030, 366 million (4.4%) people worldwide will have diabetes[1,2]. Diabetic nephropathy (DN), defined as albuminuria (albumin excretion rate > 300 mg/24 h) and declining renal function in a patient with known diabetes in the absence of urinary tract infection or any other renal disease, is the leading cause of end stage renal disease in the Western world. In the 1960s the development of assays for detection of microalbuminuria (MA) revolutionised diabetes management. MA, defined as urinary albumin excretion rate (UAE) 30-300 mg/d, is the earliest and most commonly used clinical index of DN. MA is independently associated with cardiovascular risk in diabetic patients[5-8], due in part to its role as an indicator of widespread microvascular disease and of underlying renal disease, and studies have since indicated that a reduction of UAE in type 2 diabetic patients reflects renal and cardiovascular risk reduction. Consequently, UAE has become a key therapeutic target in the management of patients with diabetes. Evidence from the Diabetes Control and Complications Trial and United Kingdom Prospective Diabetes Study Group proved that tight glycaemic and blood pressure control can reduce risk of microvascular complications of diabetes including DN[10-12] for patients with type 1 or type 2 diabetes respectively and this strategy forms the basis of current management guidelines for microalbuminuric patients. Although UAE remains an essential tool for risk stratification and monitoring disease progression a number of factors have called into question its sensitivity and specificity. The presence of MA was originally thought to be predictive of future overt DN in 80% of patients. However more recent evidence suggests that only around 30% of microalbuminuric patients progress to overt nephropathy after 10 years of follow up. It has also been shown that advanced structural alterations in the glomerular basement membrane may already have occurred by the time MA becomes clinically evident[14,15]. In addition, there is evidence that a significant proportion of patients with MA can revert to normoalbuminuria and the concept of nonalbuminuric DN is well-documented, reflecting the fact that patients with diabetes can demonstrate a reduction in glomerular filtration rate without progressing from normo-to MA[14,17]. Taken together, these results suggest that MA is perhaps more a diagnostic marker than a tool to predict DN. Therefore, there is a need to identify and investigate alternative biomarkers for the earlier prediction of DN and these are subject to this review. Glomerular filtration rate (GFR) is the best marker of renal excretory function. The current gold standard methods for determining GFR in the research setting are inulin and 51Cr-EDTA plasma clearance. The time-consuming and labour intensive nature of these techniques, as well as requirement of experienced personnel, however, mean that they are not routinely available in clinical practice. Here the most commonly used index for assessment of GFR is serum creatinine, although its sensitivity is poor in the early stages of renal impairment, as by the time an increase in serum level is detectable, a significant decline in GFR has already taken place. Formulae using serum creatinine to estimate GFR (eGFR) such as the Modification of Diet in Renal Disease equation are not reliable at GRF > 60 mL/min per 1.73 m2. The recently developed Chronic Kidney Disease Epidemiology Collaboration (CKD-EPI) formula appears to be more accurate in patients whose GFR is > 90 mL/min per 1.73 m2[19-21] however a marked underestimation of GFR in diabetic patients continues to be evident using this equation when compared to its performance in healthy individuals. The current Kidney Disease Improving Global Outcomes guidelines staging system classifies chronic kidney disease stages 1 and 2 using GFR cut-offs of > 90 mL/min and 60-89 mL/min respectively. Routine clinical tests therefore do not measure this degree of GFR decline accurately, meaning that this potentially critical early stage of renal dysfunction remains undetected. Cystatin C (CysC) based assays in estimating GFR for clinical trials in DN offer an alternative approach due to the complexity and time-consuming nature of other reference test methods. This 13.3 kDa plasma protein is freely filtered through the glomerulus and reabsorbed and catabolised by tubular cells to such a degree that it does not return to the blood in an intact form. Numerous studies have validated CysC as a marker of renal function[26-28]. Its levels are well correlated with GFR and unlike serum creatinine, are unaffected by muscle mass. In addition CysC levels not only correlate with progression of nephropathy, but also show a more sensitive marker of early DN when eGFR remains > 60mL/min[29-31]. These benefits should, however, be taken into consideration alongside the higher cost of the immunoassay and the greater intraindividual variability compared to serum creatinine Formulae for estimating GFR including both creatinine and CysC have been proposed but to date have not been proven to enhance precision in identifying and monitoring early stages of GFR decline in diabetes. Glomerular damage increases permeability to plasma proteins resulting in their excretion in the urine. In addition, abnormalities of extracellular matrix synthesis and degradation in kidney disease can lead to increased urinary excretion of matrix proteins, reflecting glomerular injury. 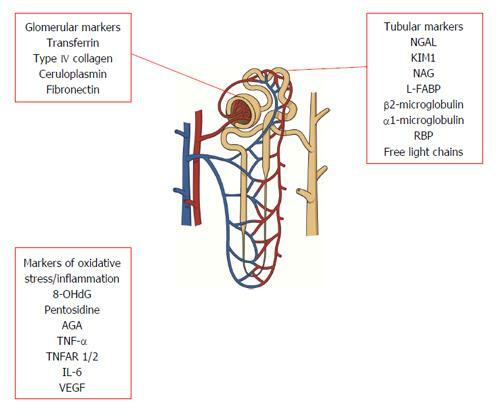 Although albumin excretion remains the current gold standard marker of glomerular damage in the clinical setting, a number of other proteins have been proposed as useful indicators of early glomerular damage. Transferrin is a plasma protein with a slightly greater molecular weight (76.5 kDa) than albumin. It is also less ionic than glycosylated albumin and thus less easily repelled by glomerular basement membrane polyanion. Elevated urinary transferrin excretion has been demonstrated in patients with diabetes compared with healthy controls, even in in the absence of albuminuria. Transferrinuria has been shown to correlate with UAE and to increase in parallel with it. In a 24 mo follow up study it has been demonstrated that increased urinary transferrin excretion predicted development of MA in a cohort of normoalbuminuric type 2 diabetic patients independent of age, diabetes duration, blood pressure, HbA1c and baseline lipid levels. Elsewhere it has also been shown that transferrinuria predicted development of MA at 5 years follow up. Transferrin has also been proposed as a mediator of tubular toxicity, as its reabsorption results in release of reactive iron in proximal tubular cells promoting formation of hydroxyl radicals[37,38]. Studies have reported correlations between urinary transferrin excretion and other microvascular diabetic complications such as retinopathy. Taken together, the above data suggest that transferrinuria may serve as a sensitive indicator of early proteinuria and increased vascular permeability. Accumulation and altered distribution of basement membrane components is one of the structural hallmarks of DN and these changes precede the development of MA. Type IV collagen is a normal constituent of mesangial matrix as well as tubular and glomerular basement membranes, with molecular weight of 540 kDa. Both serum and urine levels have been shown to be elevated in patients with diabetes. Urinary type IV collagen excretion has been shown to correlate closely with degree of UAE, as well as diabetes duration, blood pressure and serum creatinine[41,42]. Significantly higher excretion of type IV collagen has been found even in normoalbuminuric diabetic patients as well as patients with impaired glucose tolerance, suggesting that this may serve as an early indicator of DN, preceding the onset of MA[42,43]. In addition, type IV collagen excretion has been found to decrease with improved glycaemic control, suggesting that this marker is also reversible in early disease. Type IV collagen may also play a role in differentiating DN from other non-diabetic kidney diseases, as the ratio of type IV collagen to albumin has been found to be significantly higher in DN in comparison to other glomerulopathies. Ceruloplasmin is a 132 kDa acute phase protein with well characterised functions in the metabolism of copper and iron. It has been suggested that ceruloplasmin may leak through glomerular capillary walls in DN and evidence confirms increased excretion in both impaired glucose tolerance and diabetes compared with healthy controls[36,45]. Increased urinary ceruloplasmin excretion has also been demonstrated in normoalbuminuric patients with diabetes. In addition, urinary ceruloplasmin excretion appears to parallel UAE[31,46]. In a 5 year follow up study, it was demonstrated that increased urinary ceruloplasmin excretion predicted development of MA in normoalbuminuric type 2 diabetic patients. Improved glycaemic control appears to reverse this increase. Fibronectin is a high molecular weight (440 kDa) plasma glycoprotein mainly produced by endothelial cells and fibroblasts which plays a role in cell adhesion to vascular endothelium. Fibronectin biosynthesis is increased in patients with diabetes and studies have suggested that plasma levels correlate with retinopathy and MA. Increased urinary levels of fibronectin have been found in type 2 diabetic patients in comparison with healthy controls, as well as in subjects with MA compared to normoalbuminuric subjects. However, there is only a weak positive correlation between plasma fibronectin and urinary albumin levels perhaps limiting its potential usefulness as an early marker of DN, and there is no published evidence comparing urinary fibronectin with UAE in terms of predictive value for diabetic nephropathy. Plasma proteins of low molecular weight are excreted in increased quantities in the urine due to deficient tubular reabsorption or increased secretion by tubular epithelial cells. Similarly, urinary enzymes are thought to be sensitive markers of tubular damage as they are not filtered at the glomerulus due to their high molecular weight[31,36]. Neutrophil Gelatinase-Associated Lipocalin (NGAL) is a small molecule of 25 kDa belonging to the lipocalin superfamily. These proteins play a role in binding and transporting small hydrophobic molecules, apoptosis and immune regulation. NGAL is stored mainly in the specific granules of neutrophils and also expressed at low levels in several other human tissues[48,49]. NGAL shows significant promise in the diagnostic and clinical setting as a marker of acute kidney injury and is thought to also play a renoprotective role as a mediator of tubular cell proliferation. Studies have confirmed an association between NGAL and obesity, insulin resistance and hyperglycaemia in human subjects. Urinary NGAL concentration has been found to be increased in diabetic subjects compared with healthy controls and to correlate negatively with eGFR, and positively with CysC, serum creatinine and urea in patients with type 2 diabetes. Significant increases in urinary NGAL concentration have been demonstrated from normo- to micro- to macroalbuminuric groups of patients with type 1 diabetes. Similar results have been published in a study of type 2 diabetic patients. Urinary NGAL correlates positively with glomerular hyperfiltration early in the clinical course of diabetes and higher values have been found to be associated with enhanced decline in eGFR in type 2 diabetes patients with proteinuria, although this correlation was no longer statistically significant after adjustment for factors including systolic blood pressure, HbA1c and diabetes duration. However, other prospective studies have not confirmed these associations[54,55] and further investigation of the role of urinary NGAL in DN is required. Kidney injury molecule 1 (KIM1) has been shown to be a marker of tubular damage in various chronic kidney diseases[56,57]. This type 1 cell membrane glycoprotein is expressed on the apical membrane of proximal tubule cells and is involved in the phagocytosis of damaged cells in the proximal tubules. Expression is undetectable in normal healthy kidneys but mRNA and protein are markedly upregulated in acute kidney injury. In a cross-sectional study urinary KIM1 excretion has been found to be increased in diabetic patients compared to healthy controls. A weak but significant increase of urinary KIM1 concentration was noted with increasing degree of UAE. Increased urinary KIM1 excretion has also been shown in type 2 diabetics with glomerular hyperfiltration. In a 3 year prospective interventional study, high baseline levels of urinary KIM1 were found to be associated with faster decline in GFR in type 1 diabetes with DN; an association no longer significant after adjustment for traditional risk markers including blood pressure and glycaemic control. Similar findings have been described in type 2 diabetes populations. Studies have shown that treatment with renin angiotensin system (RAAS) blocking agents reduced urinary KIM1 excretion in parallel to reductions in blood pressure and UAE. In addition, low baseline urinary KIM1 excretion is strongly associated with regression of MA during a 2 year follow up period, independent of clinical characteristics. This supports the hypothesis that KIM1 is a good marker of active tubular damage, rather than pre-existing scarring. N-acetyl-b-d-glucosaminidase (NAG) is a lysosomal enzyme which is predominantly located in the renal tubules. It cannot be filtered from blood through an intact glomerular membrane due to its high molecular weight (140 kDa), thus its activity detected in urine reflects tubular dysfunction. Urinary NAG activity is increased in a variety of tubulointerstitial diseases. It is elevated in populations with diabetes compared to controls, even in normoalbuminuric patients[33,53]. It correlates with the degree of UAE and excretion of transferrin and creatinine[60-62]. Although no significant association has been found between urinary NAG and glomerular hyperfiltration, prospective follow up studies have shown that higher levels of NAG at baseline are predictive of subsequent DN. In addition, lower baseline NAG levels are significantly associated with regression of MA at follow up. Finally, significant increases in NAG excretion have been reported in type 2 diabetic patients with both micro- and macrovascular complications[63-65] and in fact NAG levels have been attributed comparable diagnostic value to UAE in this regard. Liver-type fatty acid binding protein (L-FABP) is a low molecular weight (15 kDa) intracellular carrier protein that is expressed in the proximal tubule and liver[66,67]. It is produced in response to tubulointerstitial compromise, and thus has potential as a marker of structural and functional renal tubular damage. In a cross sectional study of patients with type 1 diabetes and varying degrees of UAE, urinary L-FABP levels were significantly higher compared to healthy controls. The levels increased with increasing degree of albumin excretion. Intervention with Lisinopril was associated with significant reductions in UAE and urinary L-FABP excretion in those with diabetes. However, there is no correlation between L-FABP and rate of change of eGFR in patients with type 2 diabetes; therefore further studies are needed to elicudate its value as a predictive marker for DN. Low molecular weight proteins are freely filtered at the glomerulus and some have been used as markers of tubular damage in various renal diseases. β2-microglobulin (β2MG) is a 11.8 kDa protein produced by cells expressing major histocompatibility class 1. Urinary β2MG excretion is known to be elevated in patients with reduced GFR and some evidence links β2MG with tubular injury. β2MG has also been associated with macrovascular complications in type 2 diabetes. However, its diagnostic utility is limited by its poor stability at acidic pH. The stable microprotein α-1-microglobulin (A1M) may offer an alternative means of evaluating tubular function. This 26 kDa glycoprotein is freely filtered at the glomerulus and almost completely reabsorbed in the proximal tubules, thus even minor degrees of proximal tubular dysfunction lead to increased urinary A1M excretion[71,72]. Urinary A1M excretion has been shown to be greater in patients with type 2 diabetes compared to healthy controls[33,42]. A1M levels have also been found to correlate with diabetes duration and degree of diabetes control[63,71]. There is evidence that urinary A1M excretion significantly increases with degree of MA in type 2 diabetes[71-73]. However, Hong et al found in a cross-sectional study that although UAE and A1M were directly related, in some patients one could be present in the absence of the other, suggesting that urinary A1M (as a measure of tubular function) may be complementary to MA (as a measure of glomerular function) in assessment of early DN. Retinol binding protein (RBP) is another low molecular weight protein (21 kDa) which is freely filtered at the glomerulus and almost completely reabsorbed in the proximal tubule; as such its presence in the urine is indicative of even very minor degrees of tubular dysfunction. Increased urinary RBP excretion has been described in diabetic patients compared to controls, even in patients with normal UAE[16,70,73]. RBP levels have also been found to correlate with both micro- and macrovascular complications in type 2 diabetic patients[64,74]. RBP, therefore, may also have a complementary role in early detection of DN together with biomarkers of glomerular damage such as UAE or transferrin. Immunoglobulin free light chains (FLCs) kappa and lambda undergo similar glomerular filtration and near complete tubular reabsorption; consequently their presence in the urine can also be indicative of proximal tubular dysfunction. Abnormal urinary FLCs/creatinine ratio in type 2 diabetes patients, both with normal and elevated UAE, and FLC excretion appears to be increased before overt renal disease occurs. However, as yet there is little further published evidence regarding use of FLCs as a predictive tool for early detection of DN. Oxidative stress is thought to be one of the key mediators of vascular complications of diabetes. Generation of reactive oxygen species (ROS) as a result of hyperglycaemia contributes to development of diabetes complications through sorbitol accumulation, formation of advanced glycation end products (AGE) and activation of protein kinase C[77,78]. 8-oxo-7,8-dihydro-2’-deoxyguanosine (8-OHdG) is a product of oxidative DNA damage resulting from specific enzymatic cleavage after ROS-induced 8-hydroxylation of the guanine base in nuclear and mitochondrial DNA. Since it is excreted into urine without being further metabolised its urinary concentration serves as an index of oxidative stress. Increased concentrations of 8-OHdG have been described in both urine and mononuclear cells of diabetic patients, and urinary excretion appears to correlate closely with the severity of DN and retinopathy as well as HbA1c. In a prospective longitudinal study of 532 Japanese diabetic patients, urinary 8-OHdG excretion at baseline was associated with later development of DN after 5 years of follow up, indicating its potential as a clinical predictive marker. AGE have been associated with the pathogenesis of diabetes complications. AGE-modified proteins generally undergo glomerular filtration and subsequent catabolism at the proximal tubule, thus it seems intuitive that the presence of AGE-modified protein fragments in urine may also herald early tubular dysfunction. Pentosidine is one of the major molecular structural components of AGEs and acts as a marker of their formation and accumulation. Urinary excretion of Pentosidine has been shown to be higher in patients with diabetes compared to healthy controls. Increased urinary and plasma Pentosidine levels have been demonstrated in patients with DN. More recently its potential as a marker of microvascular complications of diabetes has been shown with associations between serum Pentosidine levels and diabetic retinopathy, hypertension and hyperlipidaemia in addition to DN. Although initially no correlation between Pentosidine levels and UAE were reported, recent publications have challenged this finding; one study reported significantly increased serum Pentosidine levels in diabetes patients with MA compared to normoalbuminuric controls and another study found increased median urinary Pentosidine excretion in diabetes patients with macroalbuminuria compared to controls. In addition, this study demonstrated that baseline urinary Pentosidine excretion predicted later macroalbuminuria, with risk increasing almost 7-fold for every 50% increase in urinary Pentosidine. Evidence is accumulating that immune and inflammatory mechanisms also play a role in the pathogenesis of DN, as cause rather than consequence of disease. Individuals who progress to DN appear to display features of low grade inflammation for years before clinically detectable disease[90,91]. As a result, cytokines and other components involved in the process of inflammation and endothelial damage have attracted attention as potential markers of DN. Orosomucoid, or α-1-acid glycoprotein (AGA) is a single chain polypeptide produced mainly by the liver. It is released in response to inflammation under the stimulation of cytokines such as interleukin-6 (IL-6) and tumour necrosis factor-α (TNF-α). AGA levels have been found to be associated with ischaemic heart disease, lung cancers and diabetes[92,93]. It has been suggested that high AGA levels may predict the development of type 2 diabetes. In a cross sectional study of outpatients with type 2 diabetes and no known cardiovascular disease, serum AGA levels were found to correlate significantly with UAE. In addition, proteomic work has identified urinary AGA as an independent risk factor for DN[96,97]. Urinary AGA excretion appears to increase in parallel with UAE and data indicate that urinary AGA is elevated in the early stages of DN. The potential predictive value of urinary AGA in DN has been shown but further work is needed to determine whether AGA could be used as a biomarker of disease development and treatment response. TNF-α and IL-6 are two major pro-inflammatory cytokines that stimulate the acute phase response by triggering production of other proteins such as CRP and AGA[89,93]. Patients with DN have higher serum and urinary concentrations of TNF-α than healthy controls or normoalbuminuric subjects[99,100]. Urinary TNF-α excretion also appears to be increased in diabetes patients with micro- or macroalbuminuria compared to normoalbuminuric patients[100,101], with one study reporting an increase of 90% between normo- and microalbuminuric patients. Urinary TNF-α excretion has also been shown to correlate with NAG excretion, a marker of severity of tubular damage. TNF-α mediates its effects via two distinct receptors, TNF receptor 1 (TNFR1) and TNFR2, which are both membrane bound and also can be found in serum in soluble form. Serum levels of both these receptors have been shown to correlate with GFR in diabetic patients independently of albuminuria status. More recent data suggest that serum concentrations of TNFR1 and TNFR2 have potential as predictors of progressive renal disease in diabetes[103,104]. Patients with TNFR levels in the highest quartile show significantly elevated cumulative incidence of reaching stage 3-5 CKD over 12 years of follow up compared with those in the lower quartiles. This has been shown in both type 1 and type 2 diabetes, in the presence or absence of proteinuria[103,104]. Serum IL-6 has been shown to be elevated in patients with diabetes compared to control subjects, as well as between normo-, macroalbuminuric and overtly proteinuric patient groups[105,106]. In addition, IL-6 has been linked to glomerular basement membrane thickening. Furthermore, association has been demonstrated between circulating levels of both TNF-α and IL-6 and micro- and macrovascular complications of diabetes. Vascular endothelial growth factor (VEGF) is a potent cytokine that induces angiogenesis and increases endothelial permeability. It adversely affects the glomerular filtration barrier by enhancing its permeability to macromolecules and exacerbating proteinuria. Urinary VEGF excretion appears to be elevated in patients with diabetes, even at the normoalbuminuric stage[109,110]. A significant increased urinary excretion of VEGF in micro- and macroalbuminuric type 1 diabetic patients has been demonstrated. Work in type 2 diabetes demonstrated that urinary VEGF concentration increases with DN stage. This has not been demonstrated in plasma. However, baseline serum VEGF level did appear to be predictive of subsequent DN in a follow up study of children with type 1 diabetes. In addition, both serum and urinary VEGF levels have been shown to be elevated in patients with diabetic retinopathy, although the sensitivity of urinary detection was poor. Taken together, these findings led to the proposal that plasma VEGF is a reliable marker of generalised vascular dysfunction and retinopathy, whereas urinary concentration may serve as a sensitive predictor of risk of subsequent MA (Table 1). Table 1 Summary of biomarkers with potential utility in diagnosis of diabetic nephropathy. Biomarker Serum/plasma or urine Type of marker Status in DN Potential for additional information beyond UAE Ref. DN: Diabetic nephropathy; NGAL: Neutrophil gelatinase associated lipocalin; KIM1: Kidney injury molecule 1; NAG: N-acetyl-b-d-glucosaminidase; AIM: α-1-microglobulin; L-FABP: Liver type fatty acid binding protein; RBP: Retinol binding protein; FLCs: Free light chains; 8-OHdG: 8-oxo-7,8-dihydro-2’-deoxyguanosine; AGA: α-1-acid glycoprotein; TNF-α: Tumour necrosis factor α; TNFR 1/2: Tumour necrosis factor α receptors 1 and 2; IL-6: Interleukin-6; VEGF: Vascular endothelial growth factor; CKD: Chronic kidney disease; UAE: Urinary albumin excretion; MA: Microalbuminuria. In 1989 Seaquist et al demonstrated strong familial clustering of DN, triggering a search for associated genetic variants. However, identifying gene variants that predispose to DN is complex as susceptibility is likely to be determined by a large number of common allelic variants, each of which may confer a modest increase in relative risk. In addition, overall risk of developing DN is a result of a combination of both genetic and environmental influences. Advances in genotyping technology have led to use of genome wide association scans (GWAS) for studying disease susceptibility across the entire genome. In relation to DN the creation of groups such as Family Investigation of Nephropathy and Diabetes (FIND) and Genetics of Kidneys in Diabetes (GoKinD) have facilitated such research. The FIND group is a large multicentre consortium making use of family based linkage analyses in multi-ethnic groups to identify genes with significance in type 2 DN. Results of the group’s preliminary genome scan observed evidence linking chromosome loci 7q21.3, 10p15, 14q23.1 and 18q22.3 with DN. Further publications by the group have shown a significant contribution of chromosomes 1q43, 8q13.3 and 18q23.3 to eGFR phenotype, and suggested contribution of chromosomes 3p, 7q, 16q and 22q to UAE status in African-American and European-American populations. GoKinD group have accumulated a collection of DNA for genetic association studies of DN in the context of type 1 diabetes. This group have identified genetic associations for DN susceptibility at candidate loci near the FRMD3 and CARS genes. In addition, variants in the ELMO1 gene on chromosome 7p have previously been linked with DN in Japanese and African-American populations with type 2 diabetes. GWAS data from the GoKinD collection confirmed this association in a Caucasian population. A genome wide linkage scan in Diabetes Heart Study families detected significant evidence for linkage with eGFR on chromosomes 2p16, 7q21 and 13q13. Evidence for linkage to UAE however was far weaker. In addition, genome wide DNA methylation analysis in a case control study of 192 Irish patients with type 1 diabetes identified 19 prospective CpG sites associated with risk of DN. In 2012 the Genetics of Nephropathy: an International Effort consortium undertook a meta-analysis of GWAS of DN in type 1 diabetes. They identified signals in an intron in the AFF3 gene on chromosome 15 and linked this to DN mechanistically by providing evidence that AFF3 expression is linked to transforming growth factor beta-driven fibrosis in cultured epithelial cells[124,125]. Although this locus technically did not replicate, the potential for misclassification through identifying cases using clinical rather than histological criteria may have led to reduced statistical power. Proteomics is the study of the proteome, reflecting the protein content of the genome, and is defined as “the knowledge of the structure, function and expression of all proteins in the biochemical or biological context of organisms”. These methods have attracted attention in recent years as a potentially important tool for early, pre-clinical disease detection as they allow simultaneous examination of the patterns of multiple urinary and plasma proteins. In view of the complex pathogenesis of type 2 diabetes, it is perhaps simplistic to expect that a single biomarker will provide sufficient sensitivity and specificity for disease prediction, detection and treatment monitoring, and therefore such multimarker approaches are appealing. Both urinary and plasma proteome analysis have identified a number of biomarkers which are significantly associated with DN, such as specific collagen fragments[127,128], cytokines[128,129] and RBP. A panel of 65 urinary biomarkers (DN65) have been identified which distinguished normoalbuminuric patients with diabetes from those with DN. This panel proved sensitive and specific for distinguishing DN from other causes of CKD in both single and multicentre settings[127,131]. CKD273 is a panel of 273 urinary peptides which shows promise as a tool for early detection of DN. First described in 2010, the panel was initially shown to distinguish between CKD of any aetiology and healthy controls with 85.5% sensitivity and 100% specificity. It has also recently been shown to predict adverse outcomes including death or end-stage renal disease in CKD patients. Two further studies have demonstrated the predictive power of CKD273 in identifying diabetic patients at risk of progression to overt DN. In longitudinal samples from a small cohort of 35 diabetic patients Zürbig et al showed that application of the classifier to samples from normoalbuminuric subjects up to 5 years prior to detection of macroalbuminuria enabled early identification of those at risk of progression (area under the curve 0.93, compared to 0.67 for urinary albumin). Similarly, Roscioni et al applied the classifier to samples from the Prevention of REnal and Vascular ENd-stage Disease (PREVEND) cohort. They compared samples at baseline and 3 years for 44 “progressors” who transitioned from normo-to MA or from micro- to macroalbuminuria to matched controls who did not transition in albuminuria status. Results showed that classifier score at baseline was independently associated with progression of albuminuria. Further to this CKD273 has recently been validated in a multicentre setting. In 165 urine samples obtained from 87 cases of DN and 78 controls at 9 centres worldwide the classifier distinguished cases from controls with high consistency across all centres (areas under the curve ranging from 0.95 to 1.00). A classification factor cut-off of 0.343 was established in the biomarker discovery cohort to highlight individuals “at risk” of later DN and this has been confirmed by other studies[134,135]. Metabolomics involves the measurement of low molecular weight intermediate and end-products of cellular functions in a biological sample, and has recently emerged as a tool with potential in novel biomarker discovery. The metabolome combines biological information from the genome, transcriptome and proteome, allowing identification of physiological and pathological changes in response to disease processes.As with proteomics, a variety of sample types including serum, plasma, tissue and urine can be analysed in this way. A number of studies have explored the application of metabolomics approaches in kidney disease. For example, in a cross sectional analysis of plasma metabolites using samples from 30 non-diabetic male subjects with CKD stage 2-4, major differences were identified in arginine metabolism, carboxylate anion transport and coagulation pathways with increasing CKD stage. However, this study did not include patients with diabetes and in fact there are a limited number of such studies focussing on diabetic kidney disease. In serum samples from 78 type 2 diabetic participants, a panel of 19 metabolites was identified which could differentiate DN from normoalbuminuria, all of which correlated significantly with albumin creatinine ratio. A model comprising the five best performing markers (including γ-butyrobetaine and symmetric dimethylarginine) resulted in AUC value of 0.927 for diagnosis of DN. Another study using serum samples from patients with DN, normoalbuminuric diabetic patients and healthy volunteers showed significant changes in amino acid and phospholipid metabolism between study categories, as evidenced by alterations in leucine, as well as the sphingolipids dihydrosphingosine and phytosphingosine. Additionally, the application of metabolomics methods to renal cortex samples from streptozocin induced diabetic rats identified an increase in intrarenal organic toxins, including glucuronides, uraemic toxins and others associated with glucotoxicity, which were significantly correlated with 24 h urinary protein levels.Furthermore, treatment with the ACE-inhibitor Fosinopril appeared to block the accumulation of these toxins. There is little published evidence from longitudinal studies to determine the predictive power of these methods for detection of individuals at risk of DN. One such paper published earlier this year described the application of metabolomics methods to urine and plasma samples from the PREVEND study over a median follow up period of 2.9 years. Differences were seen in plasma histidine and butenoylcarnitine, as well as urine hexose, glutamine and tyrosine between individuals who transitioned in albuminuria stage compared to control sample who did not. Adding these metabolites to a predictive model including baseline albuminuria and eGFR appeared to improve risk estimation for transition to macroalbuminuria. However, the complexity of the human metabolome remains perhaps the biggest challenge in translating these techniques into everyday clinical practice (Figure 1). Figure 1 Biomarkers for diabetic nephropathy. NGAL: Neutrophil gelatinase associated lipocalin; KIM1: Kidney injury molecule 1; NAG: N-acetyl-b-d-glucosaminidase; L-FABP: Liver-type fatty acid binding protein; RBP: Retinol binding protein; 8-OHdG: 8-oxo-7,8-dihydro-2’-deoxyguanosine; AGA: α-1-acid glycoprotein; TNFAR 1/2: Tumor necrosis factors-α receptors 1 and 2; IL-6: Interleukin-6; VEGF: Vascular endothelial growth factor. DN is a leading cause of end stage renal disease and in combination with the increasing worldwide prevalence of diabetes poses an enormous burden to healthcare systems. UAE is currently the gold standard for detection and monitoring of nephropathy and cardiovascular risk in diabetes; however its predictive powers have limitations and research is focussing on biomarkers which may offer greater sensitivity and earlier detection to facilitate earlier intervention. A degree of caution should, however, be exercised in relation to aggressive early intervention as to date there is little evidence of benefit from these strategies and more intensive RAAS blockade can result in a high incidence of unwanted adverse effects[142,143]. The Randomised Olmesartan and Diabetes MA Prevention study confirmed a significant delay in onset of MA with olmesartan therapy in normoalbuminuric type 2 diabetes patients, but caused controversy regarding increased fatal cardiovascular events in the treatment group. It could be argued that perhaps these studies have not targeted recruitment towards a population at particularly high risk of developing DN and focussing efforts in the direction of these individuals may yield more positive results. Identification of biomarkers to stratify patients according to DN risk may allow randomised controlled trials to focus on the population most likely to derive benefit from early, aggressive intervention. Markers of glomerular damage show some promise for this purpose. In particular transferrin and type IV collagen appear to detect glomerular dysfunction at the normoalbuminuric stage although head to head comparative data are lacking. Similarly, given that tubular damage can precede glomerular pathology, markers such as NAG, KIM1 and NGAL are interesting. Evidence also points towards the role of oxidative stress in the pathogenesis of DN, meaning markers such as 8-OHdG and pentosidine merit further investigation. Low grade inflammation and endothelial damage is detectable in the pre-clinical stages of DN, leading to heightened interest in markers such as cytokines and AGA. These too appear to be potentially useful tools in the earlier detection of DN, although again comparative work in relation to UAE would strengthen the case for their use. The development of new technologies has led to exciting possibilities in the search for ideal biomarkers for DN but, despite the vast number that have been studied, none has so far demonstrated superiority to albuminuria. While biomarker research in the preclinical setting is advancing, none of those biomarkers described above have been validated or are available commercially for clinical use. In addition, none have been described in relation to nonalbuminuric DN, which may reflect a separate disease process. All such potentially interesting markers require further large scale validation in prospective clinical studies to determine whether they can make the transition from bench to bedside. Projects such as the EU-funded Proteomic prediction and Renin angiotensin aldosterone system Inhibition prevention Of early diabetic nephropathy In type 2 diabetic patients with normoalbuminuria (http://www.eu-priority.org ) study which is currently recruiting, may help to redress this balance. As the complexities of the biochemical mechanisms underpinning DN continue to be unravelled it is perhaps simplistic to expect that a single biomarker will be sufficient for risk stratification as we move towards predictive and personalised medicine, and as such the shift towards systems biology integrating different technologies into multimarker strategies might provide greater sensitivity and specificity. A number of biomarkers show promise as tools for early detection of DN, yet to date none have out-performed microalbumin in larger scale, prospective longitudinal studies. Multimarker approaches such as metabolomic or proteomic methods are particularly appealing as they also offer an insight into the multiple complex pathophysiological processes underlying DN. In order to advance these efforts, cross-omics profiling, large scale biobanking and extended clinical phenotyping will be necessary to derive disease-stage specific models. It should be borne in mind that nonalbuminuric DN is not uncommon and may reflect an alternative underlying disease process, therefore longitudinal studies investigating the performance of biomarkers to identify these individuals early may also be of interest.